What breed of game chicken is this? What breed of game chichen is this? I used to own a pure bred game hen, I know that for sure. She was blue on the body, and had a goldish orange neck. She was not a banty, and all Ive found that she could be is a blue breasted red OEG. I need to know what breed/variety of game she is. 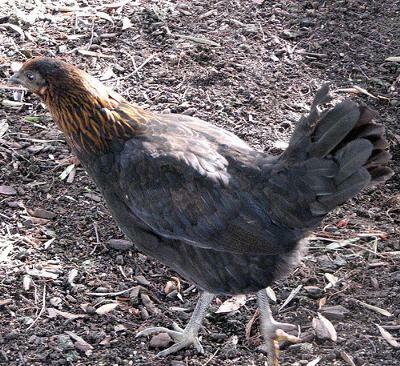 I found a picture of a hen that looks almost identical to her on Google Images. This is the picture of the hen. 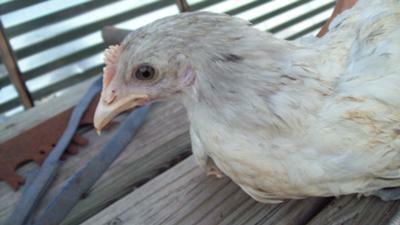 If you know what breed she is then thats the breed of my old hen. I know this is a game hen, but what VARIETY? Any one can answer, I'd be very gratful. Hey guys can anyone tell us what type of game hen this is? What breed and age are my chickens? What breed and age are my chickens? I would like to know what breed my chickens are? Can you estimate the age of my chicks by looking at the attached picture please? Will they lay eggs, because its unknown whether either of them are roosters or chickens? If they both lay, at what age will they start to produce eggs? And finally when do we need to upgrade them into a chicken coop? 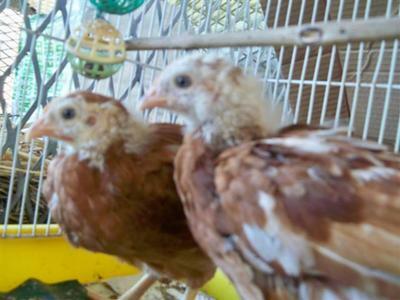 Your chicks appear to be about one month old and possibly Rhode Island Red crosses? There are several breeds with this coloring so it’s hard to say. One seems to have all reddish feathers and the other some white feathers mixed in. It’s difficult to know the sexes at this point, but I’m guessing female due to the lack of comb development. It’s a lot easier to tell if you have more than 2 chicks of the same age as the males generally have thicker legs and more prominent combs. As they feather out and near full size, the young cockerels will develop cycle feathers to the sides at the base of their tails, in most breeds. The male’s combs generally look bigger, long before you hear them crow or see any eggs. In mixed breeds you could be seeing a straight comb in one chick and a rose comb in another, so you can’t go by comb alone. Most hens will begin laying by 6 – 7 months of age; diet and climate and stress levels can play into this as well as some breeds maturing more slowly than others. The thing to focus on is getting and keeping chickens in the best possible health with good diet, exercise, and shelter. You will find in depth information in the articles on this web site. By the time your chicks are about 7 weeks they can handle temperatures in the 70’s. You will need to provide artificial heat until they are much older, especially at night, if your weather is cooler than 70. Remember drafts, breezes and winds will move heat right out of a chicken’s warm feathers, so always provide easy access to shelter day and night. Your chicks will let you know when they don’t need the heat. If day temps are warm enough, give them the run of the coop during the day and back to the brooder at night. Even before moving the chicks from the brooder, it’s always a great idea to expose them to some sunshine, even through a window; just be careful they never get too hot. The sunshine provides many health benefits and can help build a healthy immune system to prevent disease. Various Chicken breeds: I recently ordered about 30 chicks from Murray McMurray's "Rainbow Layer" selection, so they send various breeds of their choice. They are now about 8 weeks old. I have figured out what most of them are, but I have one young hen that I have been unable to figure out. She is actually my favorite one, simply because she is the most friendly of all of them. She always comes right up to me when I come into the pen and follows me around. She resembles the leghorns, except she has grayish-black legs. She is mostly white feathered except she does have a lot of greyish-black coloring mixed in around her head and neck, as well as a few greyish-black feathers mixed in with the white here and there on the rest of her body. Can you give me any ideas as to what breed she might be? Or perhaps she is a mix of some kind? From the picture you sent the first thing that pops into my mind is the Cornish breed. These are commonly used as broiler birds and they are usually what you buy for meat when you buy chicken in the supermarket. Most of these are white, but they do vary in color. The main difference is that Cornish normally have yellow beaks and legs. Perhaps it is a mix of some sort. What Breed is this? 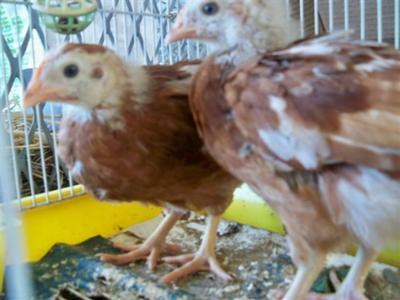 What breed/variety of game hen has a silver blue body and orange-gold (more gold) neck feathers? She was not banty and was extremely aggressive to other hen/roosters. My dad (deceased) bought her off a game fowl breeder, but I don't know where. I would like to own more. From what I've found on Google, she resembles a Blue breasted Red OEG. Please email me back with your opinions. It will be very helpful, and I will be very grateful. It would be difficult to know the breed by color alone. The near infinite variety of coloring in chickens seems possible to be brought out in just about any breed. Just when you think you’ve seen it all, some creative person comes up with an amazing new color type in a breed that’s never been seen before. She could be a Blue-Red variety. I had a friend that loved OEG Bantams and she had every color variety imaginable from white to black and everything in between. There are many breeds of “game fowl” and some breeds are so similar it takes a real expert to tell them apart. She could also be cross bred or a non-standard example of her breed. Her aggression could be breed specific, but not necessarily. You didn’t mention the type of housing you have for your birds. Some chickens just don’t play well with others. Sometimes aggression is purely a response to the environment. When introducing adult birds into an existing flock there can be some pecking order disputes. Even when a hen returns to the flock after nesting somewhere, there can be ritual battles between hens. Sometimes a hen is just not in the mood or won’t accept a certain rooster and is expressing her opinion. The game breeds do seem to be more in touch with their wild nature and can be more territorial and act less domesticated than other breeds. I’d say what ever breed she most resembles is probably what she is or mostly is.